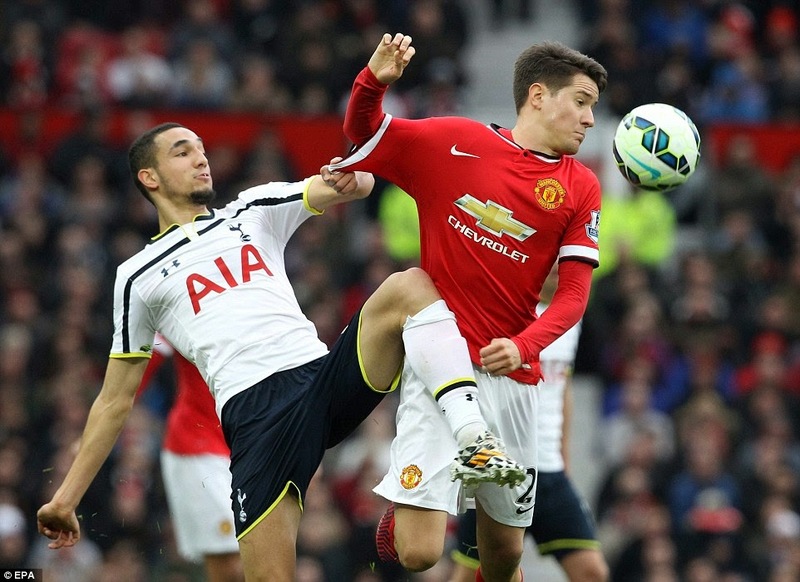 United deliver Spurs a ‘knockout punch’. Louis van Gaal was unhappy with Rooney getting knocked out in a friendly boxing bout but was pleased that his team delivered an uppercut to Spurs. Following the bitter disappointment of defeat in the FA Cup at the hands of Arsenal it was the turn of their North London neighbours to visit Old Trafford in an attempt to pour more misery over United. 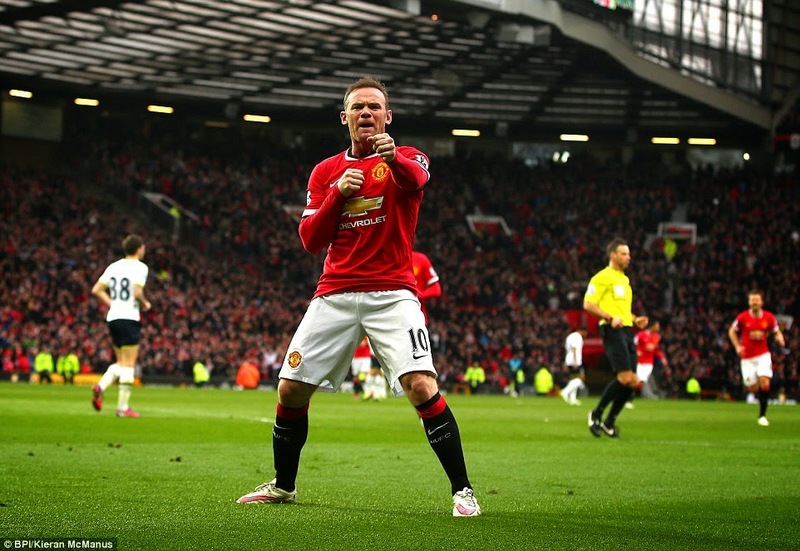 There was a time when a victory over Tottenham was about as sure a thing as you could imagine for United. Not so anymore as prior to this match, they were without a win in five against the Londoners. This match was the first of the last ten matches that will define United’s season and form for a run of wins needed to obtain that all important top four finish. Therefore guaranteeing a place in the Champions League. Still without the injured striker Robin van Persie and with Angel Di Maria serving his ban for grabbing the ref’s shirt in the last match, Louis van Gaal chose a first team consisting of De Gea, Valencia, Jones, Smalling, Blind, Carrick, Herrera, Mata, Fellaini, Young and Rooney. The substitutes were Lindegaard, Rafael, Blackett, A Pereira, Januzaj, Falcao and Wilson. There were three changes for United, as Jones, Carrick and Mata come in for Shaw, Rojo and Di Maria. Juan Mata made his first start in the Premier League for Man United since January 17th. 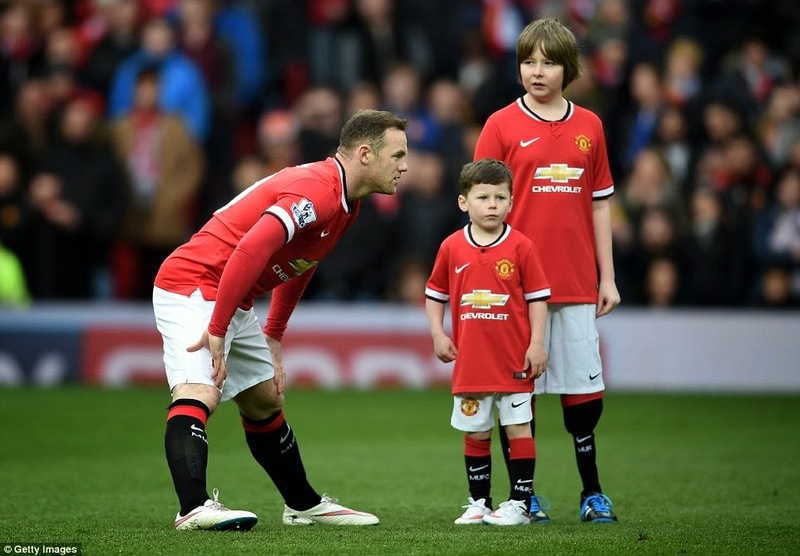 Manchester United was led out by captain Wayne Rooney and his young son Kai as the matchday mascot. United started the match in a 4-3-3 formation with Rooney in his favoured position up front with Fellaini just behind. Young and Mata were out wide with Carrick and Herrera in the middle and a flat back four with Blind at left back. United’s first chance on goal came after a minute as Ashley Young tried his luck from outside the box which the keeper collected easily. With only two minutes of play elapsed Phil Jones delivered that dreaded back pass again and almost put de Gea in trouble but thankfully the keeper managed to clear for a corner. When will they ever learn? In the seventh minute, Rooney burst into the area chasing a great through ball from Young and pulled the ball back aiming for Herrera who just couldn’t get there ahead of the Spurs defender. Then a minute later came the crucial early goal and what a goal. Carrick played a brilliant through ball for Fellaini who took it in his stride and confidently smashed it past keeper Lloris. A fantastic start by United with a sublime pass by Carrick add that together with the Belgian’s left-footed finish meant that this was the perfect start for the Red Devils. In fact, it had been a high tempo start from all the team with the fans also in full voice. This had been by far the best start by United in a game for a long time with the team attacking full of confidence and their passing was spot on. 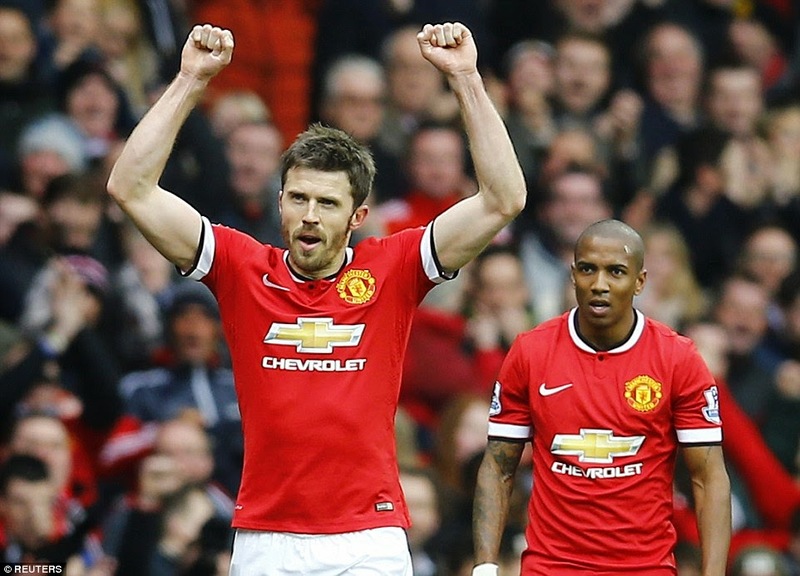 Again Young was impressive down the left and Carrick in tandem with Herrera controlled everything in the middle. The second goal came in the 18th minute as a corner was swept over by Mata and was headed back into the danger area by Fellaini when it was cleared straight to Carrick who intelligently lobbed a header over all the defenders and back across goal into the far side of the net. Leading 2-0 and playing with a determination rarely seen recently this was like the United of old. Carrick’s goal was similar if not as crucial to the important header by Steve Bruce against Sheffield Wednesday all those years ago as United headed for their first Premier League title. On 22 minutes, Young’s run almost produced a killer pass into the penalty area but no-one was there to take advantage of his great ball. At this time, it was one-way traffic as Spurs had not even managed a shot on target. Four minutes later a great cross from Fellaini across the area almost played in Mata but he was just unable to get to it in time. Then the stadium shouted for a penalty for a foul on Mata but unfortunately he had been flagged offside. Chris Smalling tried to bring the ball forward and it looked like he could go all the way to the opposition box but in the end his final pass was too strong for Rooney. 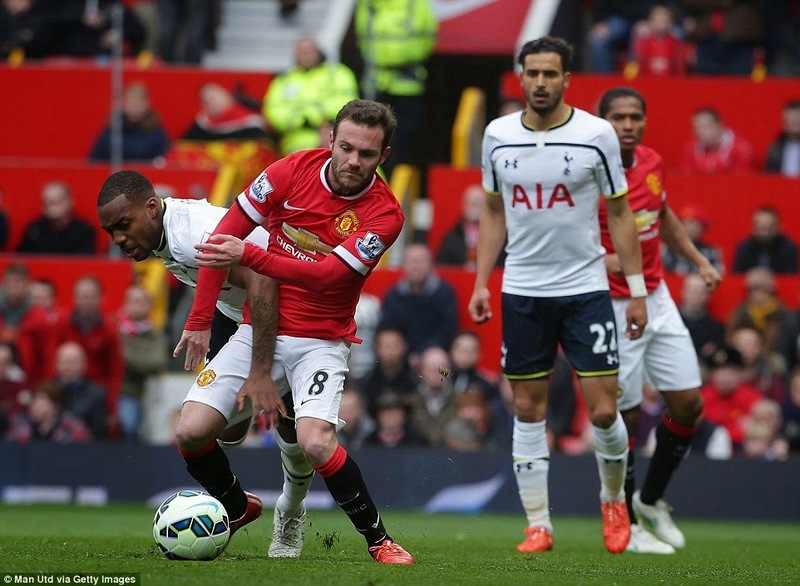 Mata was the only booking of the match for United after he was cautioned for a foul on 32 minutes. That the only blight on a terrific performance by the home side. The third goal came in the 33rd minute as Rooney collected a poor pass from Spurs and took on the defenders by himself and once in the box there was no doubt about the outcome as he slotted the ball into the corner of the net. A great individual goal by a forward totally on top of his game. And what can we say about the celebration, ‘knockout’. 36 minutes in and again it was Fellaini who caused mayhem down the left as he whipped the ball in for Rooney who scuffed it slightly. That was almost the fourth goal and great link up play between Fellaini and his captain. 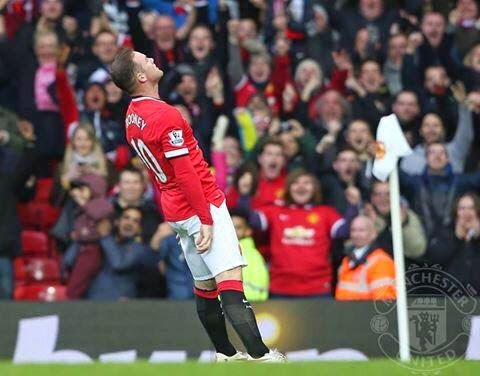 On the stroke of half-time, there was still time for Rooney to try his luck from distance but he fired wide. Good job he missed as I doubt he could better his goal celebration. This was by far the best 45 minutes played by United all season a half full of inventive play and confidence with all the team on top of their game, especially Rooney and Fellaini. It’s truly refreshing to write positively about the side after their recent disappointments. The hope was that they could continue in the same vain in the second-half. With the type of start made by United, the biggest question was where had this team been hiding all season. Spurs had had no shots on goal that’s how impressive United had been. 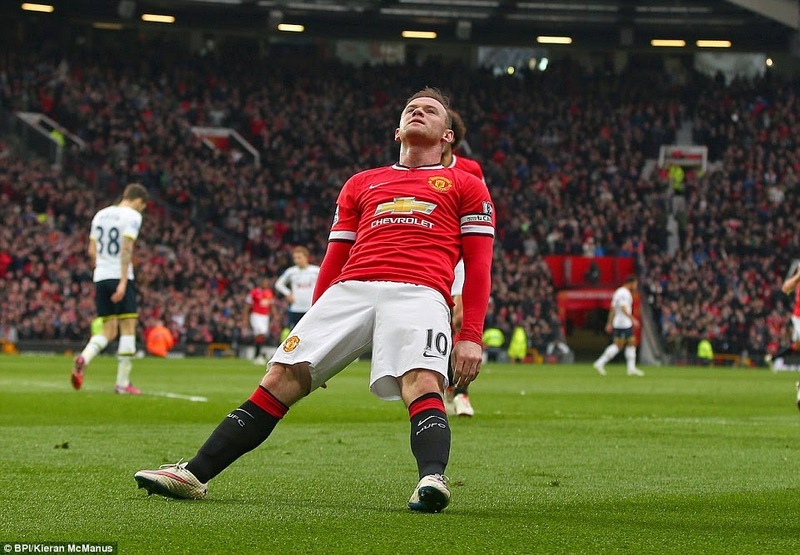 United started the second half attacking the Stretford End with no changes made by van Gaal. In the 47th minute Spurs had their first clear attempt on goal by Dembele which was high over the bar. Rooney was on fire and once again in the 48th minute he tried to nod one down for Fellaini, but the ball deflected back into his path at the edge of the area. He couldn’t quite wrap his foot around it and strikes it over. As I have said before if only he had been used up front more often in the season who knows where we would have ended up. United continued with their tidy passing play from the first half and Spurs hardly got a sniff of the ball and when they did United quickly snuffed it out. In the 51st minute, Rooney tried yet again to lay off a chance to a colleague this time for Blind but the Dutchman dithered a little and the chance was blocked. 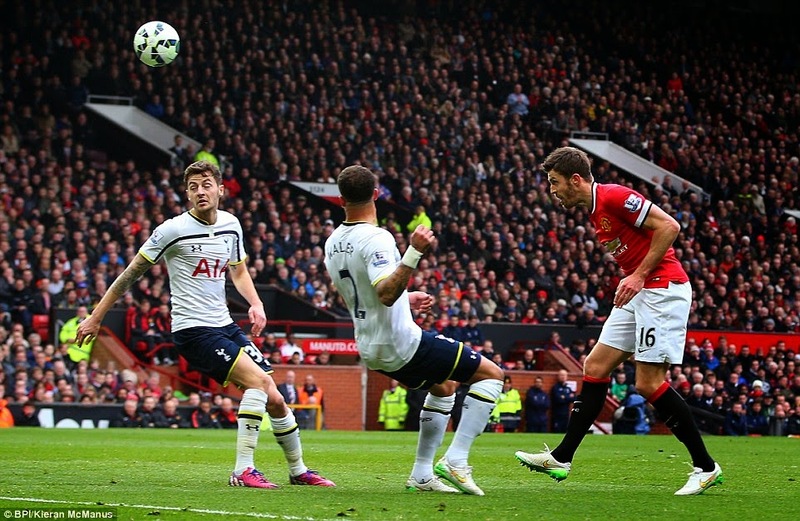 Mason should have done better for Spurs a minute later but pulled his shot well wide of de Gea’s goal. 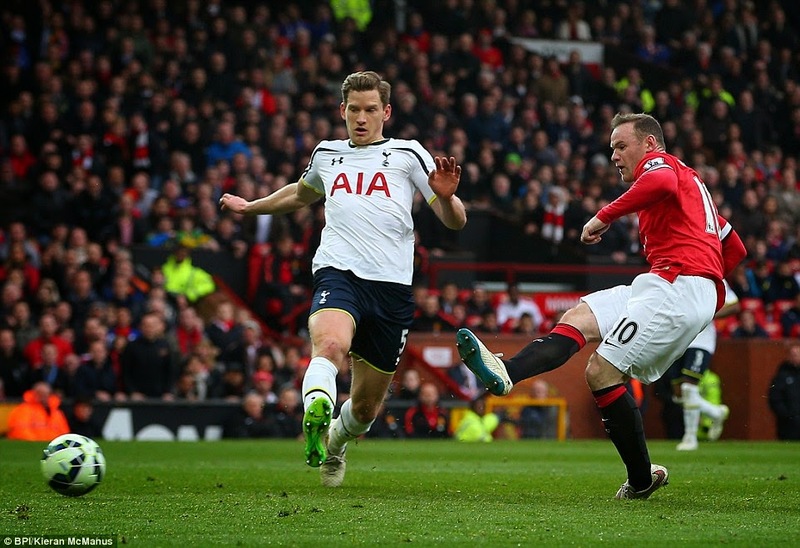 In all honesty Spurs never looked like scoring or even troubling David de Gea. Over the next ten minutes United enjoyed a period of passing practice as they fully controlled the game none more so than in the middle of the park with the trio of Carrick, Herrera and Mata impressing. On the hour mark, Blind almost played Herrera in on goal with a slide rule pass which was unfortunate not to come off. Another blistering run by Young down the left wing earned United a corner which came to nothing however, credit to Young as he has shown in recent matches the old magic has returned and he looks like a player who is really enjoying his football. 64 minutes and the crowd witnessed a wonderful cross-field pinpoint pass by Rooney straight to Fellaini that started a move which ended with Herrera firing his shot into the side netting. Another move of precision by the Reds which was a joy to watch. With fifteen minutes left on the clock United had the ball in the back of the net but the flag was up well before Rooney had tucked it away as Herrera was flagged offside, perhaps wrongly, after a long ball over the top. Shortly after the Spaniard had an effort from distance which flew wide. After 76 minutes, there was a fully deserved standing ovation for Juan Mata as he left the pitch to be replaced by youngster Pereira. It was fantastic to see the reception given to Mata as he made his way down the touchline and towards the tunnel he really is a fan favourite and he put in a performance that merited the applause. Here’s hoping that he doesn’t have an injury problem. The second change came in the 82nd minute when Fellaini was taken off and Falcao was given another opportunity. Fellaini, another player who had played his socks off and opened the scoring with aplomb received the second biggest round of applause of the day. In the 84th minute captain fantastic Rooney was back clearing the defensive lines as Spurs tried to salvage something from the match. Van Gaal’s third and final change of the match was in the final minutes which saw Rafael come on for the impressive Carrick who had fully earned his early rest. As the match reached it’s climax Harry Kane almost squeezed the ball into the net but David de Gea made an improvised save by sitting on the ball, not his greatest save, but it kept a valuable clean sheet. Disappointing there were no goals in the second half, but that doesn’t take anything away from the great performance by the team with no goals conceded and a huge morale-boosting three points ahead of some tricky matches ahead. 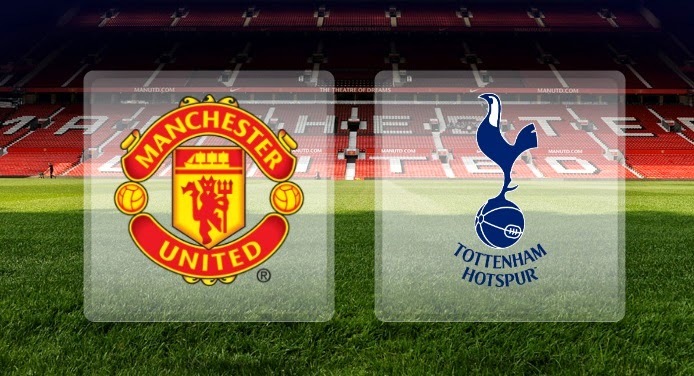 Spurs were really poor in the match but in all fairness they couldn’t have expected United to play as well as they did today and I think they were as surprised as anyone by the way the home side came out of the blocks firing on all cylinders. It would seem that the players have an appetite for achievement this season, after all. Nine to go and if the Red Devils can keep up the momentum from this match then not only a top four but dare I say a top three finish to the season is a definite possibility. But first there is the small matter of a trip to Anfield to take on our bitter rivals Liverpool. A repeat of today’s performance would be invaluable to the team’s confidence for the run in and I fully expect a victory especially with Rooney in his current mood. Previous Munich ’58: The Flowers of Manchester. Next Derby Day Delight for United.